Do it often enough and this move is bound to give you and your AC joint grief. It has been said that there are no bad exercises, just exercises that aren’t right for a lifter ‘right now.’ Barbell strength training exercises – like the military press – are performed with a fixed movements pattern and require both mobility and stability. If a lifter has had previous injuries, is just generally weak, or is really ‘tight’ in certain areas, it can negatively affect his ability to perform the compound movement with good form and a full range of motion. So, to ensure a training effect, a regression must be introduced into the training program to replace or ‘alter’ the exercise for greater safety while addressing specific limitations. Here are 4 modifications for the military press to help you train better and get stronger. Performing military presses with your feet side-by-side can put a lot of pressure on your lower back, especially when you have very tight hip flexors. Staggering your stance, where one foot is slightly ahead of the other can take the pressure off your lower back and help create a more stable lower body. Homework: Perform hip flexor mobilization drills in the warm-up and between sets of your main exercises to help release and relax your hip flexors and create a more neutral pelvis. If you’re dealing with a shoulder injury and pain when pressing overhead, changing to a double underhand (supinated) grip on the bar and using a EZ Curl bar (instead of a straight barbell) may help alleviate stress and strain on the shoulder joint, shift more of the focus to the front delts and improve your ability to press fully overhead with weight. Along with underhand military pressing with an EZ curl bar, Arnold Presses with dumbbells may also be a safer and more comfortable alternative for your shoulders. Homework: Continue working on your thoracic mobility with thoracic extensions on a foam roller and start a comprehensive shoulder rehab protocol to improve the function and health of your shoulder joint. With many of my older clients and athletes who have had previous shoulder injuries, neutral grip pressing (where the palms are facing each other) has been a game-changer. 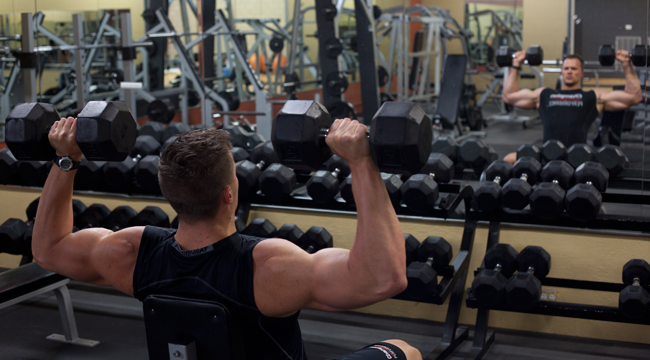 You can either use dumbbells and press with a neutral grip or use a Swiss bar – a specialty bar with multiple neutral grips setup with hand positions of varying widths. Homework: Continue integrating foam rolling of the lats, pecs, upper back, and traps – in your comprehensive warm-ups. Slowly progress to vertical pressing in your workouts by first starting with a flat bench and increasing the angle of the bench with each set. This will give you a slower and easier transition to vertical pressing and prepare your shoulders, back, and triceps for the demands of military pressing. Instead of performing standing military presses, switch to seated pressing with a high incline bench – where the bench is higher than an incline bench press but not quite completely vertical. If you are overarching in the lower back when you’re seated on the bench, take a wider stance and put your feet out in front of you. Homework: Start working on standing military press with the barbell only and focus on a full range of motion. Progress very slowly and continue working on your weaknesses. Jim Smith, CPPS, is a highly respected strength and conditioning coach and Fitness Advisory Board member for Schwarzenegger.com and numerous national publications. As the owner of Diesel Strength & Conditioning, Jim has been called one of the most "innovative strength coaches" in the fitness industry. Jim’s FREE gift – The Mass Report – has been used by thousands of lifters and athletes to build muscle faster and break through training plateaus.